Nissan in August celebrated the sixth generation of its popular Altima sedan, announcing a $170 million investment to its Canton, Mississippi and Smyrna, Tennessee assembly plants to the produce the 2019 model. 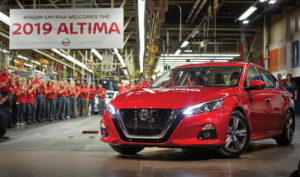 Production of the 2019 Altima began Aug. 23 in Smyrna, Tennessee. That plant has produced nearly 4.6 million Altimas since the first one rolled off the line in June 1992. With the newly announced investment, Nissan has now committed nearly $12 billion across all of its U.S. manufacturing footprint. “Nissan’s continued investment in our manufacturing facilities underpins our commitment to building top-quality vehicles in the U.S., as well as our valued workforce and the communities where we do business,” says Heath Holtz, senior vice president, Manufacturing, Supply Chain Management and Purchasing, Nissan North America, Inc.
Nissan’s $170 million was primarily used to upgrade Smyrna Vehicle Assembly Plant and Canton Vehicle Assembly Plant with the latest manufacturing technology. The work included a body shop brazing system that provides the flexibility to weld the vehicles’ sleek trunk lid, while the paint shop got a new polyurethane stone guard coat paint system that provides a more durable exterior appearance. Nissan also added calibration equipment that helps ensure the reliability and functionality of ProPILOT Assist technology. ProPILOT features rear automatic braking, enhanced driving performance and available Intelligent All-Wheel Drive. The all-new Altima arrives on dealer lots in the U.S. this fall and will be produced at Nissan Smyrna and Nissan Canton assembly plants.